This nation is in Vacation Mode for the next 2,135 turns. This nation cannot be attacked or traded with during that time. Macedonian Empire is a nation led by Lord Zendelov on the continent of Europe. Macedonian Empire's government is a Monarchy with very moderate social policies. Economically, Macedonian Empire favors extremely left wing policies. The official currency of Macedonian Empire is the Euro. At 92 days old, Macedonian Empire is a mature nation. 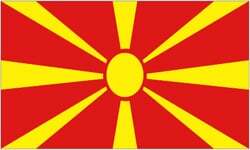 Macedonian Empire has a population of 2,062 and a land area of 500.00 sq. miles. This gives it a national average population density of 4.12. Pollution in the nation is almost non-existent. The citizens' faith in the government is at an all-time high with an approval rating of 100%. 02/02 09:18 pm - TheNG removed Zendelov from the alliance Acadia.